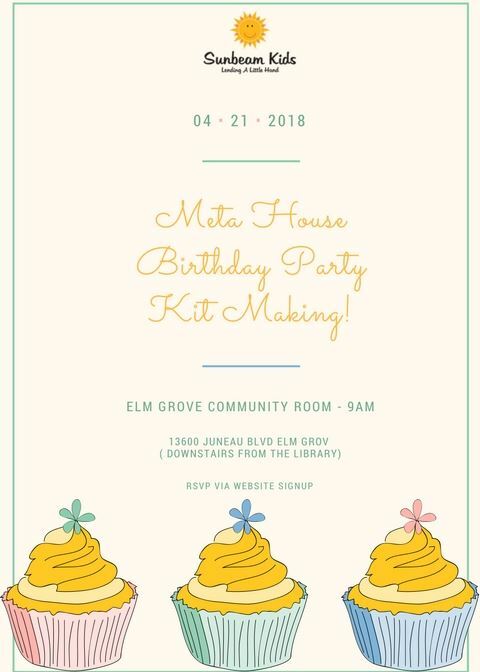 Thank you for registering to attend the Birthday-Party-In-A-Bag project for Meta House, a joint project with the Elm Grove Junior Guild. Please enter one registration for your entire family. We can accomodate up to 30 Sunbeam Kids families. REMINDER: Elm Grove Junior Guild families should sign up through the EGJG Signup Genius link. Every kid should have a happy birthday! On 4/21, we will be helping some very special kids at Meta House in Milwaukee do just that. Meta House is a treatment facility helping moms overcome substance abuse with both residential and outpatient programs. As we will learn from a Meta House employee who will be with us at the beginning of the project, one of the things that sets it apart is that it allows children to stay with their mothers during treatment. These mothers face many challenges, and often are not able to give their children a birthday party with all of the fun things that we usually associate with such occasions. That’s where we will lend our little hands: we will put together forty birthday-parties-in-a-bag, including a present, wrapping paper, card, cake mix and frosting, streamers, balloons, and candles. As they have done in the past for our annual joint project, the Elm Grove Junior Guild is generously donating many of the supplies. SBK attendees will sign up to bring either a gift and gift bag or a box of cake/brownie mix and frosting (see details in sign up). This project is open to members of Sunbeam Kids as well as our friends in the Elm Grove Junior Guild. There is room for 30 Sunbeam Kids families and this project is open to all ages.